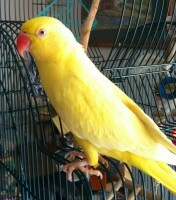 SHE IS A 2 YEAR OLD YELLOW INDIAN RINGNECK PARAKEET. SHE IS COMPLETELY YELLOW. IF U HAPPEN TO SEE HER PLEASE CALL ME AT (757) 478-8694 OR E-MAIL ME AT : DANA_V19-at-YAHOO.COM. WE MISS HER A LOT . THANK U ! ALSO YOU CAN GET REWARDED IF WE GET OUR BABY BACK!